Britain's data watchdog has told the European Parliament she is "deeply concerned" about the impact on democracy of the misuse of social media users' personal information. Information Commissioner Elizabeth Denham told an MEPs' inquiry into the Cambridge Analytica affair that legal systems had failed to keep up with the rapid and unforeseen development of the internet. Ms Denham said that her office's investigation, triggered by allegations of misuse of Facebook users' personal data, was "unprecedented in its scale" and thought to be the largest undertaken by any data protection authority in the world. MEPs on the Committee on Civil Liberties, Justice and Home Affairs heard that the Information Commissioner's Office (ICO) investigation covered potential criminal and civil breaches involving more than 30 organisations and dozens of individuals, including social media companies, data brokers, analytical firms, academic institutions and political parties and campaign groups. More than 40 investigators are working full-time on the ICO probe, backed up by around 20 external legal and forensic digital recovery experts, and have already seized hundreds of terabytes of information on servers and computers. As well as pursuing specific allegations - many relating to the use of data in the UK's 2016 EU referendum - the ICO is aiming to produce a report by the end of this month on the regulatory and legislative reforms needed to respond to the challenges of targeted online advertising. 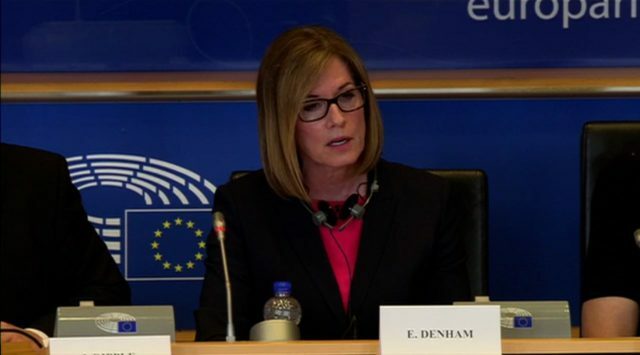 Ms Denham told the committee: "We have seen that the behavioural advertising ecosystem has been applied across political campaigning to influence how we may vote. "I am deeply concerned about the fact that this has happened without due legal or ethical considerations of the impacts on our democratic system." Big technology companies now "have control of what happens with an individual's personal data, they control what we see, they control the order in which we see it and the algorithms that are used to determine this", she told MEPs. "Online platforms can no longer say that they are merely a platform for content. They must take responsibility for the provenance of the information that is provided to users." Ms Denham added: "I recognise that some aspects of our legal systems have failed to keep up with the unforeseen pace of the internet." The EU's new GDPR regulations - which have led to a flood of emails over recent weeks requesting the right to continue using individuals' data - represented an "important step forward", she said. And she told the MEPs that her inquiry has the ability to force change, so long as politicians ensure that regulators have the powers to take robust action. "Our investigation and action in this case will change the behaviour and compliance of all of the actors in the political campaigning space," she said.